Connectivity is one of our biggest challenges in Orlando. Between the lakes and the bad land use, it seems like a cyclist can’t go more than a few miles on shady, quiet streets without being channeled onto an arterial road. Likewise, motorists have few options for traveling from point A to point B, so those arterials tend to be congested, sending cut-through motorists onto the few connected residential roads. It’s a double-whammy for cyclists. My explorations have revealed some secret connections and many unused easements or places where little more than a fence stands between networks of quiet streets. The addition of very simple infrastructure could create significantly-improved access to destinations. We’re gathering this information for Bike/Walk Central Florida, the new local chapter of Florida Bicycle Association. 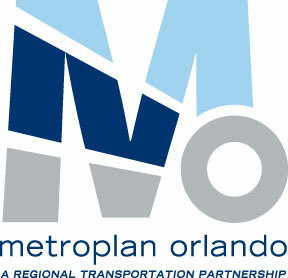 It will be complied and presented to the Metroplan Orlando BPAC. It’s important to have grass roots public input and support to increase permeability and connectivity. The above map is a collaborative effort to gather your local knowledge and wishes about street network connectivity. Click through to the larger map and edit it yourself. Use green pins and/or lines to indicate existing “secret” connections that allow cyclists (and pedestrians) to connect quiet streets. Use blue pins and/or lines to identify opportunities to create new connections. Please type the city or area into the marker title. Thank you for your input! 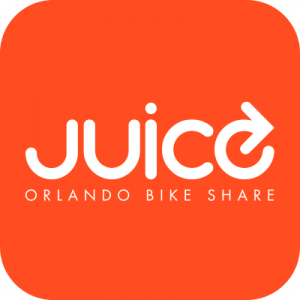 Together we are making Metro Orlando better and better for cycling. I did an experiment for dirt connections with a pin and line. There was no orange pin color so I used red. If you don’t like it I will change it back. The red works fine, let’s go with that. Thanks!! StreetView even shows it under construction! This is awesome!! Thank you so much for your work on this! I notice that there a bunch of connections on bikemapping.edats.com which aren’t on this map. Should I add them so there is a single resource? Yes. I’d love it if you could do that! I love the community input. This is so cool! Done. Although one seemed to dump into a lake so I left that out. It is in Maitland. I added a purple pin to our map. I couldn’t figure it out, there appears to be a couple of easements that end at water. That’s a bike/ped bridge. I changed it to green and filled out the description. You can see it in the background of this photo. I know that this will sound picky, but before I put mine in, I took a swing by to see them again. Things change so fast around here that when they don’t change we start wondering why. I think permeability is the most exciting concept in transportation cycling these days. In Fort Worth, I can follow a freeway access road for awhile and actually enjoy it because the access road loops back around under the freeway at two point- at the river and a mile later at a train track. Because car traffic cannot pass through on the access road, it is very lightly traveled. The only cars you see are the ones getting off and turninginto the neighborhood and so they are going slow. The barriers that prevent cars from going through don’t stop me on my bike though- for the river I can ride maybe a quarter mile out of my way to the MUP along the river, cross at a low water crossing, then ride right back to the freeway access road. To cross the train track I simply have to pop a curb, go across a stony area and come out on an adjacent road maybe 70 feet away. That road crosses the tracks. The city bike plan actually has a provision to put a cutout in that curb and pave the path to the other street. Small improvements to permeability like that give a much better payback in terms of bicycle infrastructure than building a MUP. It benefits cyclists, pedestrians and drivers by getting people-powered transport onto less-traveled streets with lower speeds, and away from the fast, busy roads. Even if a house was purchased to be demolished and a 150 foot-long path built to sidewalk standards, it would be cheaper than building MUPs at a million dollars a mile. Not to disagree with Eric but where does tho commonly quote $1M/mile number come from? I looked at Volusia County docs a while back and their numbers are more like $500K/mile for something like the Spring to Spring trail which has a significant amount of grade work. $1M/mile would seem to imply a lot of extra facilities. What is interesting to me when riding around is that the Wekiva trail, which I had previously felt was underutilized for such an expense, is more travelled than most neighborhood roads. MUP’s would seem to be far better value. Bike boulevards or other simple permeability/livable street options seem much more so again. I didn't pull that number out of the air. I think it was the Cady Way Extension that cost that much, not including the cost of the bridge. The bridge cost another $6 million and won numerous design awards. The amount of money spent on the bridge could have paid crossing guards for 50 years. I spotted a long pedestrian bridge in Maitland today over 17-92 where 414 terminates. If someone can confirm that one can ride across it I’ll add it to the map. Yes, that bridge connects Mayo to Gamewell. Mayo goes to Maitland Community Park, there is a dirt path and wood bridge that connects to the corner of Arapaho and Tunderbird. The park gates are closed from 8PM to 8AM (IIRC), but there are 2 other sidewalk connectors between those 2 neighborhoods. Check out the green line on this map for what that route looks like. There’s a description in this post. Nothing like a good excuse to get out and do some riding on a beautiful day. I went with by daughter in tow up to the section of the Cross Seminole Trail just south of Lake Mary Blvd. Last time I was there I saw folks coming out of the neighborhoods and though it would be fun to explore for a bit today. I added a some more markers to the map. What I find quite amazing is that after spending so much money on the trail section that there is not a single proper neighborhood access point onto the trail that doesn’t involve a collector road. There are a couple of breaks in fences and signs of folks making their way through existing easements. I saw lots of walkers, joggers and easy going riders so clearly local residents have a desire for trail access. Keri, great project. I’ll be on the lookout for additions to the map. Great idea, Keri. I hope it becomes a great resource. I’ve been using the waterwitch cut thru since seventh grade. Here in key west, one of the hardest fought battles was the staples bridge, which was a great permeability project. On idea buying a property, cutting out the right of way from the path, then reselling it, I noted such an opportunity on our map under “Longwood – Connect Sleepy Hollow Subdivision Northbound” although it assumes the water utility would give up a little land also. There is also some info on how homebuyers valued trails. Presumably homebuyers also value good access to the trails. 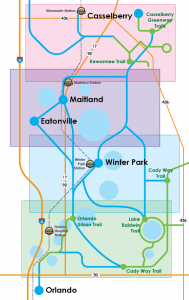 Going to the extreme, I’m told that around Wekiva Springs area there are some 29 miles of neighborhood pathways. I marked the area on our map.I was going to go ride it to map it out one day but 29 miles is a whole lot of narrow pathway to explore. Not such a nutty idea after all. I thought of this 10 years ago and dismissed it in my own mind as nutty and never said anything about it in public. Reselling the pieces is something I never thought of. There are people who would be willing to pay money, GOOD money, to get most of the lot next to them — maybe just for privacy. They would pay even more if the zoning laws were “bent” a little to allow building on a narrower lot. The money they might pay could pay for the lot and the sidewalk/trail improvements. Now is the time, while prices are depressed. I added a couple to http://www.openstreetmap.org/?lat=28.41372&lon=-81.49671&zoom=16&layers=M – there’s a dirt track connecting the end of Buena Vista Woods back to Apopka-Vineland, and a paved park path between Buena Vista Woods and Smith-Bennett. Feel free to add them to this. Yes! Please also read my take on suburban connectivity. I have had more requests for use of the aerial photo on that page than for anything else I have put up on the Web. 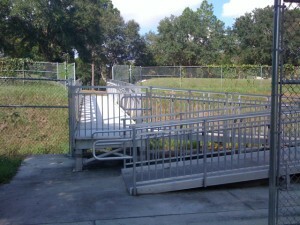 Tickets in Miami Central Florida Earth Day April 24th — Free Bike Parking! !